My youngest, Ayvah, turned five this past week and we held her birthday party this weekend. 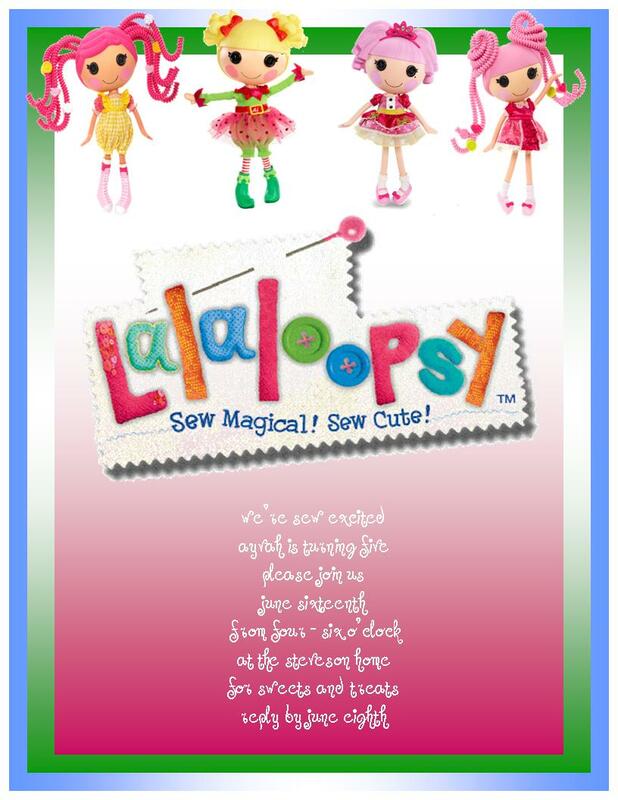 Of course, she lives and breathes all things Lalaloopsy, so such was our theme this year! With my kids passing around a flu bug earlier in the week and our evenings devoted to baseball and softball this time of year, I have to admit that I didn't get to all of the party projects I had planned. But, what did get done turned out cute and my little one loved it all! Above is the invitation that I created for the party. Here are a few overview shots of the party. My thirteen-year old daughter, Allanah, created a "Pin the Tiara on the Lalaloopsy" party game. She made a big, colored picture of a LaLaLoopsy doll (drawing it free-hand, might I add!) to hang on the wall along with creating un-colored little tiaras for each girl to first color how she wanted. The guests then used their own tiaras they colored to "pin" on the doll while blind-folded. I was so proud of her for the time she put into this and how it turned out! It was a big hit with the girls! I'm actually thinking of framing the big doll picture for my five-year old's room. And, here's a photo of the birthday girl with the little tiaras all "pinned" to the Lalaloopsy doll at the end of the game. For the center display on the party table, I turned a large bowl upside-down, covered it with a colorful skirt from Claire's ($16.00 online) and put a flower serving platter on top that we later filled with finger foods for the girls during the party. I thought it was adorable! We filled some glass vases and containers with Lalaloopsy dolls and their little pets. We used some of my daughter's Lalaloopsy sets and furniture to set up little scenes down the main party table. And, we used cute colored buttons as table "confetti." I bought disposable table service in the Lalaloopsy logo colors ... pinks, greens, blues, yellows and oranges. I used white muffin liners to fill with Goldfish crackers when it was time for the party to begin. I created little place setting cards by assigning each guest a Lalaloopsy character and adding their name. I made little circular Lalaloopsy printables that we attached to white lollipop sticks to place in the food on some of the serving platters. We used "fancy" toothpicks to serve salami, cheese and black olive "kabobs" (my daughter's favorite things). I am sooooo not the baker-type, but did decide to try my hand at making an ice cream cake ... it was pink lemonade and strawberry flavored. Unfortunately, I ran out of time on the decorating aspect, but had purchased cute Lalaloopsy cake toppers on Amazon for around $12.00. They double as cookie cutters ... so those will be put to use even after the party! My thirteen-year old stepped in at the last-minute and created a couple of needles with thread (made from fruit-flavored Tootsie Rolls) that we put on the cake ... along with some (washed) Lalaloopsy figures, some buttons and some edible crystal flakes. It wasn't perfect or exactly how I had envisioned it, but my birthday girl was happy! We made "Trix Treats" in the style of Rice Krispie Treats ... the colors worked perfectly! I was inspired by the recipe on Cravings of a Lunatic. The photos didn't turn out that great because of the glare of the glass dome, but they were a big hit! And, our lime punch was, also, a hit with the little ones. I soaked lemon slices overnight two nights before the party in water tinted with 5 - 6 drops of food coloring, then froze the slices overnight after that to make colorful lemons to float in the punch. I used neon food coloring so they were quite bright! All in all, it was a fabulous day! Knowing this is my last child really makes me relish this age. She is our youngest with the oldest being 22, so I know exactly how fast time really does fly! Here she is at the party in all of her beautiful glory! Happy Birthday, my sweet Ayvah!